With nearly 12 years experience in real estate business, Lori Samson has a solid reputation for working hard for her clients. She is highly motivated, results-oriented, performance-driven and dedicated to her buyers and sellers every need. Hire Lori as your realtor, and she'll get the job done swiftly, seamlessly and successful, whether you are buying or selling a home. Upon meeting her, you'll see she's expert at making a strong first impression very quickly, and understand why she's known as such a strong deal closer. Lori's high energy, excellent marketing skills and negotiating Savvy always comes into play to ensure the best sales experience possible. Lori works with clients who are seeking or selling properties in all neighborhoods of Northwest Arkansas. 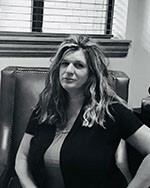 She takes time to discuss each individual's unique needs and to educate clients throughout the process on market conditions, neighborhood offering, pricing and renovation options so they can make smart and sound decisions.